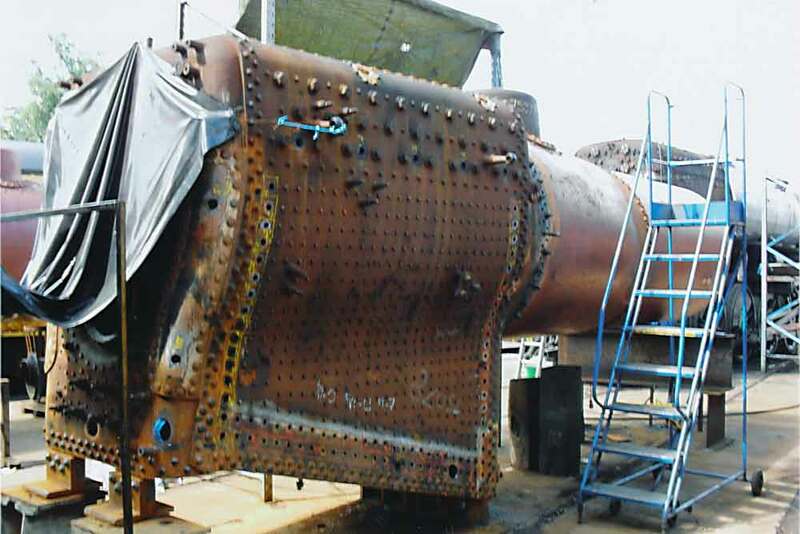 There has been big progress on the boiler at Crewe, which includes the completion of the roof stays, the imminent fitting of copper stays to the centre back plate and fitting of flanges to the centre of the throat plate. More especially, the really good news was that the new barrel was ready for riveting to the firebox as the attached illustration shows. Back in Haworth yard, there has been further progress on the bottom end with the machining of the new cylinder end casting and completion of the axlebox bearings, which Ralph lngham was scraping in at the beginning of the month. Stuart Bray, who retired in July, is spending more time about the place than he was previously able, and oversaw the refurbishment of the manifold during September and has now turned his attention to the water gauge frames. The Thursday volunteers have made some valuable contributions too, Colin Smith has returned the spectacle window frames from home in sparkling condition, Vernon Hobson has cleaned and sanded the our wooden cab side window frames and Lister Pollard has attended to the cylinder end bolts. The tender lining out is all but complete, thanks to the skill of Roger France, and Tim Hanson has agreed to apply the crests and the finishing varnish. With the imminent commissioning of he Sl60 2-8-0, there is reason to believe that the paid staff at the shed will be detailed to work on No.75078 as the next locomotive required for traffic, and this will obviously accelerate the process. Amongst the stored engine equipment is a collection of oil feeders and bottles, the nozzle of one of which had been damaged at some point in the past, meaning it would no longer pour. Thanks to Arthur Peach of the Bahamas Loco Society this is now back with us and in perfect working order.